Help your Toyota stand out on the road with genuine Toyota parts and accessories! Our Toyota dealership near San Antonio, TX, has a Toyota parts center that’s filled with OEM Toyota parts that are perfect for repairing or customizing your Toyota. 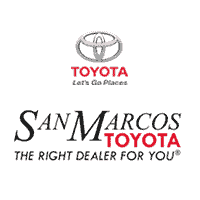 Whether you’re looking for authentic Toyota accessories such as license plate frames and truck bed liners or rear spoilers and all-weather floor mats, San Marcos Toyota is your one-stop Toyota shop. We also have plenty of Toyota parts for sale that range from spark plugs and tires to new transmission belts and more. Simply visit our Texas Toyota dealership to shop our Toyota parts inventory and buy genuine Toyota parts and accessories today. You can also order OEM Toyota parts online and have them shipped directly to our local Toyota dealership instead. Our Toyota parts specialists are happy to install your OEM Toyota parts and accessories for you onsite, or show you how to do so yourself back home. Either way, San Marcos Toyota is ready to help you complete your next project!